People Grow over a period of time. And yet the twist here is that in this journey many a times, they grow apart ! Sounds shattering to those who’ve experienced the pain of losing a best friend or someone special owing to moving in different cities or being incredibly busy in their “growth” journeys. Yes, this is the flip side that time and distance brings to a lot of relationships. Friendship turns into silence, silently ego creeps in – “why should I bother to contact if he/she is too busy even to bother replying to my texts”, slowly people drift apart. Mutually. Yes, this is the sad side that time and distance cumulatively bring in. There were times I would only look at this sad part of the bigger picture and crib about increased distances in friendships and relations. We’d give a consolation saying “you know what; you’re not on whatsapp naa, that’s why it is so difficult to keep in touch.” But try to recollect, how much has your “touch” increased in spite of all modern social networking applications installed in our smart phones. Yes, this is life my friend ! It throws lemons at us. But the point I realised today is that instead of throwing back the lemons, it’s wiser to make a lemonade. It meant that relations that “need” to be maintained aren’t true ones and the true ones flow rather seamlessly without any “need” to maintain them. At that time I was almost in a dilemma as to how can this be possible ! Every single thing needs maintenance. Be it a car or friendship. I decided not to ponder deep and kept those words of wisdom with me for a later thought. Months passed by. After a lot of time today I was returning home from Andheri amidst the hectic Mumbai traffic at 7 pm. I had nothing to do other than staring out from the window and let my brain wander off in fields of imagination. She moved to a different city. In fact, another country. NO NO, wait ! Another continent. Several hundred thousand miles away. That’s the thing about distance. It demands to be felt ! I lost a part of my soul I felt. I too soon moved to a different city with new people all around and she also seemed to have lost amidst the busy demanding life abroad. There seemed to be a huge huge void in my life. I missed talking to her endlessly. I missed her assurance when I panicked. She made new friends there, lived the life she always dreamed about – roomies, freedom and new college. I too had a similar story. New city, new job, independence, like a bird out in the open sky ready to soar on. We tried our best to keep in touch. Whatsapp. Emails. Facebook. Everything. There was also a considerable difference between our time zones. By the time she’d be free it would be past 1 AM in India. Generally, I am an early sleeper. I tried keeping awake till 1.30 am, shelling a few hundred bucks for those few minutes of candid comradeship we once shared effortlessly, for international calls. It all seemed so different and difficult now. People change. People Grow. And at times, they grow apart. Well, well this is only one part of the picture I was seeing until today. I sat back in my journey home and thought. Life had definitely taken away someone from me. But !!! What I failed to appreciate is that life had in fact blessed me with a few precious buddies I can call at even 2 am just to say I can’t sleep as the mosquitoes are annoying me way too much. They are friends, I can walk into their houses with a 2 minutes’ notice “you’re home naa ? I’ll be there in 5.” People I can share the silliest thing of the day and also complain to after a hard day at work. There are also friends I meet regularly when I am visiting my city on weekends. We’d meet once or twice in 2-3 months, yet would feel like we’ve just met last evening. Friends with whom silences are seldom and conversations never run out. This is when I feel like cherishing life. Yes, It takes away a few. BUT, it will return to you many fold too. It’s just that we take the later for granted and complain for the first that makes us so discontent and grumpy. Yet, it is not to feel bad that distance and time made us drift apart from the most favourite people in our lives – parents, friends, BFFs or lovers. Instead it is to cherish those happy memories and value the time life gave you together. 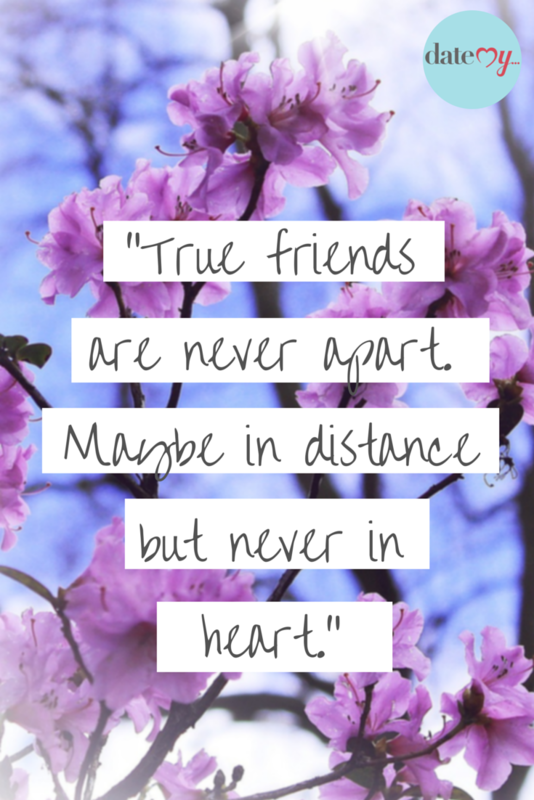 True friendship isn’t talking for an hour every single day. It is more about, the same feeling of love you have no matter how much time has elapsed since you last met. PS : I still play in my head you imitating me saying “Daffod” and it never fails to bring an instant smile on my face.